While Cornell bioengineers have used 3D printers to make live-tissue human ears, and a Dutch architecture firm unveiled plans to print an entire house in Amsterdam, a new retail space in Chicago promises to democratize 3D printing for general use. Although the technology has existed for nearly thirty years, 3D printers have recently become more accessible due to expired patents and new, user-friendly computer-aided design (CAD) software, much of which is open-source and free online. With the profit-bearing potential of 3D printing, it may come as a surprise that the Midwest’s first public foray into the technology is based on promoting public access to, rather than privatizing, this revolutionizing technology. The 3D Printer Experience, located at 316 North Clark in River North, opened Monday, April 22. Complete with a soundtrack specially created by Cirque du Soleil, it is a place to play with, learn about, and experience 3D printing technology. The Experience provides three interactive components. 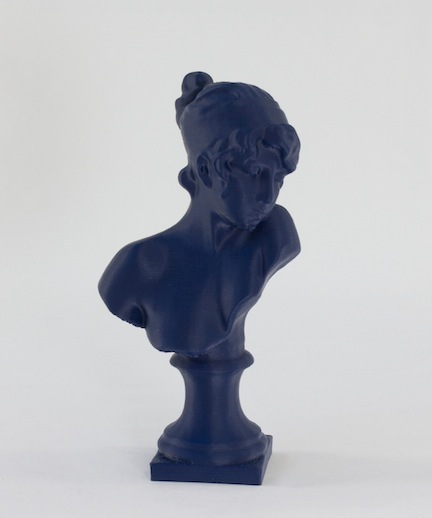 Visitors can print figurines by scanning their own heads or creating a pendant on an easy-to-use program, take workshops on 3D printing technology, or simply observe the printers in action. Available printers include the personal-use UP Mini and MakerBot, as well as the professional-grade EOS Formiga P110. The 3D Printer Experience worked with German additive manufacturing company EOS to publicly make available the industrial $250,000 Formiga P110, which is available for public use by the store’s patrons. The store also provides examples of products printed on EOS’s professional-grade machines, including a fully-usable violin and a faux-medieval glove of printed-metal mesh. The 3D Printer Experience provides an opportunity for would-be inventors to prototype and produce designs using professional manufacturing tools. In the near future, the store’s proprietors plan to add an EOS machine that prints in metal and a Filabot extruding system that transforms recycled plastic into raw plastic filament. Members of Chicago’s art community will not be surprised that Tom Burtonwood and Holly Holmes are behind the venture. Burtonwood has been teaching 3D printing at SAIC and demonstrating the technology at art events like Expo Chicago. However, at the 3D Printer Experience they join five other co-founders. Burtonwood and Holmes partnered with graphic artist and tech entrepreneur Mike Moceri, and the trio soon encountered The MetaSpace creator Julie Friedman Steele, who recently relocated from Santa Monica to Chicago to start a 3D printing enterprise herself. The various interested parties see the technology implemented in different ways: Burtonwood, the artist, can acquire a 3D printer and design unique objects, toys, or find solutions to “individual design problems.” Moceri, the entrepreneur, hopes to partner with small businesses, and cites the example of a violin-shop owner who became excited about the possibility to create individualized chin pieces. Julie Friedman Steele, the do-gooder, hopes to spark “social enterprises.” Her favorite product so far: a water bottle that a Chicago resident created to provide clean water to Haiti. The design team and social practice experiment joined forces to create this unique commercial-slash-experiential space that seems perfectly suited to whatever the imagination can handle. As innovative as 3D printing technology, the MetaSpace partnership provides a revolutionary business model that navigates between the non-profit and profit sectors. The founder of this “social enterprise ecosystem,” Friedman Steele, sees social good as a measurable, vital component to business success. Adamant on calling the newly opened locale an “experience” rather than a shop, Friedman Steele focuses on keeping this technology open-source and hopes to enable the “inner creator” in everyone. Furthermore, MetaSpace offers negotiable barter rates for “social entrepreneurs” who seek to provide a public benefit as a component to their product. The process of 3D printing itself begins with a computer-generated CAD prototype. Many pre-created designs, including artworks scanned by the Art Institute of Chicago, are available in open-source communities like thingiverse.com. 3D Printer Experience co-founder Moceri tells of a very practical use of these online communities: finding himself in a sticky situation involving a six-pack and no bottle opener, he quickly found an opener design online and saved the day with his 3D printer. Artists have seized upon the opportunity to create unique works, and printed sculptures by Chicago-based artists Joshua Harker and Claudia Hart are available at the store. The spindly, organically evolving “Tangles” and intricately laced skeletons by Harker show some of the artistic possibilities of 3D printing. Although making designs publicly available would be counter-intuitive to artistic production, the printing process allows Harker to price smaller pieces under $300. Printing out a missing part of a technology gadget, transforming an empty milk jug into a cell-phone case, or designing and printing the perfect shoes for an outfit—the possibilities for personal use seem endless. Realistically, even with the surprisingly open platform, 3D printing seems just out of reach for the unserious or the unfunded. At the 3D Printer Experience, getting an image of your face printed will range from $25 for a two-inch head or $115 for a four-inch head. 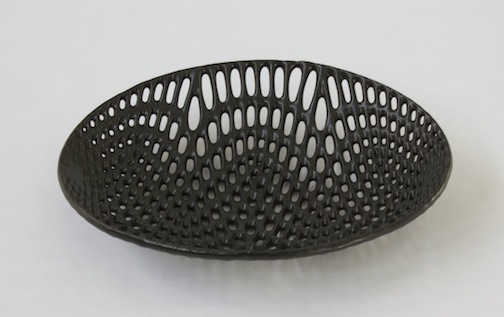 How much would it cost to print the nine-inch bowl (which is more like a small basket) that’s on display? The cost of printing a comparable design on one of the professional-grade machines would run close to $100, leading me to believe the average Joe will opt for a $20 IKEA option. Although the co-founders’ vision of democratizing product manufacturing seems a few years premature, the 3D Printer Experience provides a playground for Chicago entrepreneurs and DIY designers.